» Learning the Basics – What is an Epilator? Virtually every human will have hairs o their body that they do not want their. Some are removed because common convention suggests it is the right thing to do, others remove their hair because they like the feel of smooth, soft skin. There are even those who believe it is better for their sport for them to be hair free. Of course, once you decide that you need to remove your unwanted hair you will need to consider the best way of doing it. You may have heard of the epilator; it has certainly been around for many years. In fact, it was first designed and made public in the 1980’s. Since then the product has been refined and improved; it is now an excellent choice for leg hair, your bikini area and even facial hair. There are even products specifically designed for men. It is a small device that looks like a handheld razor. Instead of having fine blades at the head, it has a number of tweezers. These are miniscule and spin quickly, effectively plucking the hairs from your skin. In many ways it is like waxing; although it does not remove any skin cells in the process. It works by pulling the hairs from your body, including the root. This prevents them from growing back immediately. Most people who use an epilator will use them once every four weeks. Although hairs do grow back, many users note that, over time, the number of hairs becomes less and they are lighter. 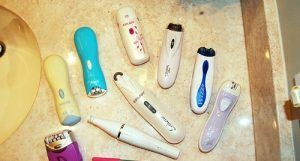 You may be interested to note that some epilators, particularly the Epilady operate via a coil as opposed to miniature tweezers; this is a matter of design and personal choice. The coil is tightly wound inside the head on one side only. The motor in the epilator simple moves the coil from side to side. In the process the coil flexes; allowing it to grasp the hairs and pull them from your body. This works in the same fashion as the coil mechanism. However, the coil is replaced with several sinning discs. The effect is the same although some users attest to it being better than the coil type; this is a matter of user opinion. An adaption of the moving discs has allowed there to be a series of meal plates added to the discs. The ends of the plates are designed like many forks and work like tweezers as they rotate past each other. In effect the tweezer motion is completed once every time the head rotates; the faster the rotation the more hairs you can pluck. However, higher speeds are not always more effective; you can achieve good results from less tweezers and a slower movement; if they pick the hairs up properly. The original epilators were designed for use in the dry. Certainly any modern epilator with a cord is still designed for dry use only. However, it is possible t purchase battery operated ones which will work in the bath or shower. The idea behind this is that your pores open more when in warm or hot water; this makes the process more effective and less painful. It is also easier to incorporate into a regular cleansing routine. There is no doubt that using an epilator is painful. How painful it is will depend upon your pain tolerance level and how often you have used an epilator or waxed before. Because the epilator only targets hairs it is generally considered to be less painful than waxing. However, it is worth noting that your hairs need to be long enough to be grasped by the epilator. The exact length will vary depending upon the device and may influence your choice of device. Not all epilators are the same. The standard one will do all parts of your body, but, there are ones which are designed to deal with more sensitive areas. These include dedicated facial hair removers, upper lip and even the bikini area. Many of these will pluck slower and remove less at each pass; this reduces the pain and sensitivity of the skin. In addition they will have specifically designed heads to deal with intricate parts f your body. Is the Epilator a Good Buy? Your budget for an epilator can range from as little as $20 to several hundred. In some ways you get what you pay for but there are many mid range epilators which will provide a good return on your investment. Aside from having laser hair removal; this is one of the most effective ways at removing hair and keeping it away for several weeks.